Exhaust Hood Cleaning for Food Trucks | Flue Steam Inc.
Food trucks have been popular in big cities like LA for years. With industry revenues up about 12 percent every year for the past five years, it has become more and more tempting for aspiring restaurateurs to try out new ideas in this mobile format. While a food truck does offer the ability to cut lots of the overhead costs you’d have with a brick and mortar restaurant, it also presents some of its own unique challenges. Varying health & permit requirements from town to town, parking struggles, bad weather, and truck maintenance issues can all take their toll, and an estimated 30 percent of new food trucks in LA fail each year. One reason you should never have to cite for a failed food truck is a kitchen grease fire. 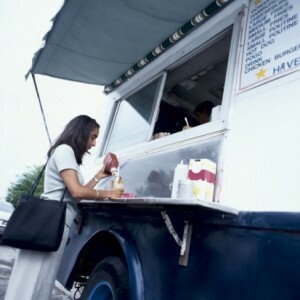 Just as in a brick and mortar commercial kitchen, food trucks offering grilled or fried delights must be equipped with exhaust hoods, vents, and fans to safely direct greasy air out of the cooking area before it can collect in the form of residue that could potentially create a fire hazard. Flue Steam helps food trucks keep their kitchen exhaust systems clean and safe with exhaust hood scraping and steam cleaning services. Considering the short depth of most food truck exhaust hoods, our hand scraping service is ideal for most applications. We use an IKECA comb to measure the amount of grease that has accumulated on your exhaust hood before we begin work and again afterwards, so you can tell exactly how much of a difference we have made. After a while we will be able to tell how fast grease accumulates based on your typical cooking activities. We can then schedule your cleaning visits accordingly so that you only pay for service when you are likely to need it. A deep steam cleaning may also be required for some food trucks on occasion. This type of cleaning enables us to reach and remove greasy residue in areas that can’t be reached by hand. Whether or not you will need this service for your food truck depends on the design of your exhaust system. Another way Flue Steam can help prevent fires in your food truck is with fire suppression equipment such as portable fire extinguishers. 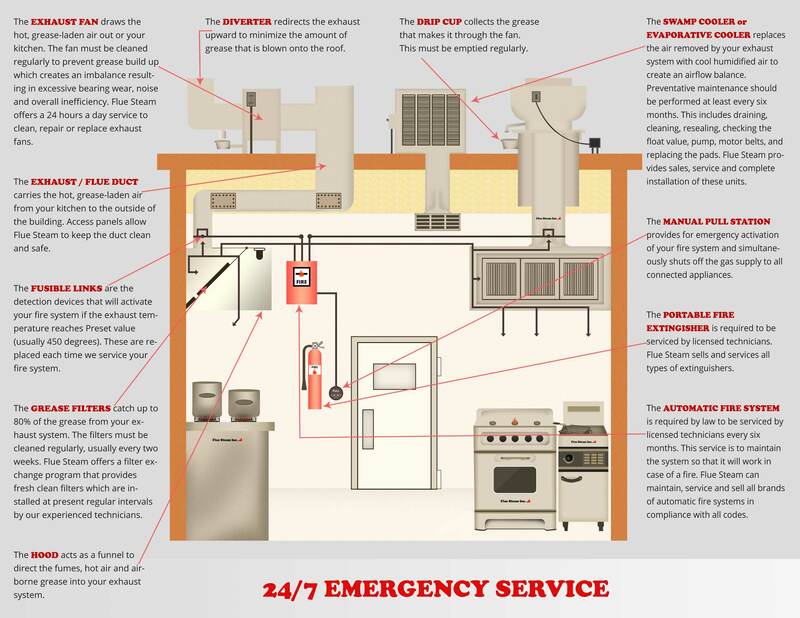 We sell and refill quality extinguishers that can be securely mounted within easy reach of your cooking surfaces to help suppress any grease fires that may break out outside of the exhaust hood. Please contact us today to schedule a cleaning for your food truck.